We rarely include gigantic metropolitan areas on these pages mainly because we feel smaller and mid size cities are often more affordable for reunions. They also have fewer attractions, which can be a good thing when trying to keep reunion members close. However, we’re making this exception and even then, we can’t graze the surface of the Dallas-Fort Worth, Texas, metroplex. The metroplex is a large conglomerate of cities headed by Dallas, facing east, and Fort Worth, facing west. But, you know, everything in Texas is always bigger and you’ll just get used to that. Dennis Schrock, Atoka, Oklahoma, started the USS Wabash reunion years after helping build the ship in Quincy, Massachusetts, then sailing her all over the world. He wanted the reunion to be a hit so, living just 120 miles north, he automatically knew Dallas was a logical reunion site. “The reasons,” he says, “are many. My wife and I are very comfortable in Dallas-Ft Worth, we stay in four and five star hotels and love to dine out. “I employed of MLRS Inc., a North Carolina reunion coordinator who contacted the hotel of my choice and took care of every need any attendee had and in style, and comfort. The reunion started March 20, 2003, the day US strikes started in Iraq. Our togetherness and respect for having served together many years ago jumped to the present. Breakfasts in the hotel restaurant were chef made, custom order omelets. Friday was discover Dallas day. We visited Dealey Plaza where President JF Kennedy was assassinated, the Old Texas School Book Depository and Kennedy Memorial. Then we visited Pioneer Plaza and the Dallas Farmers Market to sample and smell their delights. We took a leisurely drive through downtown Dallas including where the famed Ewings of Dallas hung their oilman hats. Then to Highland Park, the home of Dallas’ most wealthy. Our evening was spent at Billy Bob’s Texas, a the premier nightspot for barbecue dinner, mechanical bull, live entertainment in the bull pen, dancing and a real taste of Texas hospitality. Saturday the USS Wabash vets explored the charming blend of wild west and modern cultures in Fort Worth, once the largest stockyards in the US. It was a full day of entertainment from a live Texas cattle drive to two stepping. Later we enjoyed a banquet with some in full uniform and Sunday, after a private breakfast, short memorial service, handshakes and hugs, last minute photos and farewells…tears were authorized. Eleanor George-Velasco of Dallas area Grapevine Convention and Visitors Bureau (CVB) worked with the Class of 65-F US Air Force Reunion. It was Grapevine resident, Frank Breeden’s first time planning a reunion and he came to the CVB for information and advice. Velasco asked how many rooms he required, attendance, profile of attendees, transportation needs, other requirements. She sent the information to Grapevine’s eleven hotels, taking over the “leg work” of calling them individually. After the bids came in from hotels, she offered to take Breeden on hotel site inspections. He wanted to check them on his own, at his own pace. They booked the Homewood Suites Hotel, close to the mall for spouses. Velasco contacted the other hotels on his behalf to notify them he’d decided on another property and thank them for their assistance. Breeden asked what would be going when his group was in town. Velasco checked with the city’s Historic Preservation Department and found nothing scheduled for those dates. She suggested a wine tasting event. Instead Breeden decided on two dinners, one a barbecue and asked Velasco to check out restaurants with private rooms. She emailed her findings. Breeden scheduled a speaker for one dinner and asked where to find a podium, microphone, a flag and flagpole. Velasco contacted the convention center manager, Rusty Hernandez, who offered exactly what Breeden needed, free of charge, which delighted him. 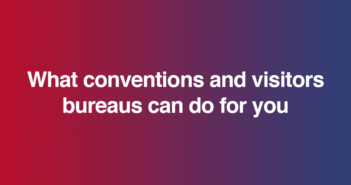 When reunions of certain size a book a Grapevine property you are offered convention services (i.e., registration assistance, information person, brochures). This group was not large enough for assistance but Velasco provided an assortment of brochures for attendees and convention service bags stuffed with Grapevine lapel pins, pens, super saver coupon books and samples of spousal itineraries. 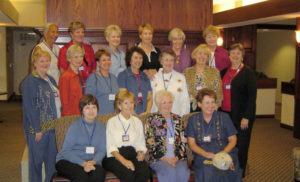 Ladies of Class of 65-F US Air Force Reunion. After the reunion, Velasco asked Mr. Breeden for a “debrief” to get feedback about hotel and attractions. He was very pleased with the hotel, the staff was wonderful, restaurants he chose were wonderful. He did not have a negative thing to say, everything was GREAT!! Breeden brought samples of what he gave to attendees. He handed out a paper bag whose handles were tied with red, white and blue ribbons. He made a map with attendees names on, a schedule of events and name tags with an inset photo of the attendee during the war, with the aircraft they flew in the background. Wives tags had the American flag as background. Contact Eleanor George-Velasco at Grapevine CVB, 1 Liberty Park Plaza, Grapevine TX 76051; 800-457-6338; evelasco@ci.grapevine.tx.us; www.grapevinetexasusa.com. Hessie Lyons of Dallas reports that the Goldsmith Family Reunion chose Dallas because it was time to try a new location and committee members live in the Dallas metroplex. The food is great and the Dallas-Fort Worth area has varieties of attractions, museums, Zoos, Six Flags, and other family activities. Dallas-Fort Worth area highlights Scheduling activities may take some extra logistics to make sure everyone gets to where they want to go. And, oh my! what a myriad of choices you’ll have. Almost any interest is addressed in a significant way in the Dallas-Fort Worth area. I concentrated on reunion favorites, heavy on history that could be fascinating to anyone. I chose a couple of groupings that might help planning if these particularly interest your reunion. Living history I am a fan of living history museums and found the Dallas area has many significant treasures starting just a block south of downtown. Old City Park is a step back in time to living history on 13 wooded urban acres. This idyllic escape in the midst of the city offers 32 structures demonstrating life from 1840 to 1910 in North Texas. Meet and interact with costumed interpreters representing historic characters going about their daily lives. Includes a fascinating Living Farmstead Project but real immersion seems to be in taking the Pioneer Experience Tour which puts you in the middle of 1861 Dallas action; must be 12 years old. Farmers Branch Lane, Farmers Branch TX, 972-406-0184; www.farmersbranch.info//ParksRec/Historicalpark.html. This 22 acre outdoor museum has 10 fully restored historic structures. Walk back in the history of Farmers Branch, Texas, from its first settlement in the early 1840s to its incorporation in 1946. Highlights include log culture, Queen Anne Victorian Cottage, a 1930s Service Station and the 1856 Gilbert House. Jackie Townsell Bear Creek Heritage Center Gilbert and Jackson Streets, Irving TX, 972-721-2426. Jackie Townsell Bear Creek Heritage Center is one of the finest Texas repositories of African-American culture and heritage. It honors area living history settled in 1850 by freed slaves. Two settlers earliest homes are restored. Fair Park is easy to say but a mouth to explain. It is a gigantic one stop center of countless attractions and the State Fair of Texas, largest in the US. It is home to the Cotton Bowl, an aquarium, planetarium, gardens, museums of natural history, science, steam railroads and two exceptional new ones I visited: the Women’s Museum and the African American Museum. Women’s Museum 3800 Parry Ave at Fair Park, Dallas TX 75226; 214-915-0860; www.womensmuseum.org. The African American Museum preserves and displays historical, artistic and cultural contributions by African Americans and boasts one of the country’s most extensive and best collections of folk art. It also houses a women’s archive, religious center and research library. No admission charge; closed Mondays. Cowboys live! Of course, you can’t visit Texas without seeing some real live cowboys in action. These are places that guarantee your wish and will send you home with great memories of the Old West. Stockyard Historic District, 130 E. Exchange Ave, Fort Worth; 817-624-4741. This October weekend event promotes the cowboy way of life. 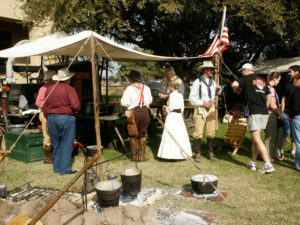 A chuck wagon camp fills public areas and re-enactors extol the virtues and intrigues of their cowboy lives. Smells from pots cooking over open fires add a pleasant dimension. Western swing music, ranch rodeo action, cowboy poetry, kids events and a cowboy trading post add to the excitement. Stockyard Historic District, Fort Worth 817-336-4374. This is the world’s only daily cattle drive! The Old West comes to life as a team of cowhands drives a herd of longhorns along Exchange Avenue through the Stockyards. Every detail of this cattle drive —saddles, chaps, hats and boots — is authentic and historically true. This is the real thing. Fort Worth faces west and everything about it is western, it looks more western as do it’s inhabitants. Featuring Joe T. Garcia’s, a hugely popular Mexican eatery, and the only daily cattle drive in the world and how much more western can you get? 3200 Darnell St, Fort Worth TX 76107; 817-738-9215; www.themodern.org. Fort Worth has a magnificent new Modern Art Museum, designed by internationally renowned architect Tadao Ando. Be prepared for a building that feels like it’s floating on water. A lovely setting housing one of the foremost collections of postwar art in the central US. 1720 Gendy St, Fort Worth TX 76107; 817-336-4475; www.cowgirl.net. 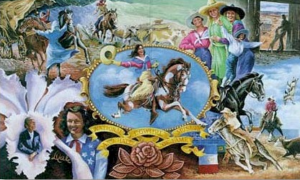 The National Cowgirl Museum and Hall of Fame is the only museum in the world dedicated to the courageous women who exemplify the American West’s pioneer spirit. No matter your age or gender, the Hall of Fame is packed with extraordinary lives you’ll want to learn more about. Exhibit galleries feature artifacts and priceless memorabilia. Interactive exhibits put you on the rodeo circuit and in the arena where cowgirls rode hard and on the ranch where they really worked hard. Rodeo champions and Western heroines are celebrated in an elegant home. Space for reunion events available. 411 Elm St, Dallas TX 75202; 214-747-6660; www.jfk.org. The Sixth Floor Museum is a reverent museum that chronicles the assassination and legacy of President Kennedy with documentary films, photographs and artifacts. If you are old enough to remember the event, visiting will resurrect strong, powerful memories. Open every day except Thanksgiving and Christmas. 3700 Hogge Rd, Parker TX 75002; 972-442-7800; www.southforkranch.com. Known as the most famous ranch in the world, Southfork hosts countless parties year round and is as expansive as it looks on TV. Dallas fans will want to tour the Ewing Mansion, open daily for guided tours of a little bit of television history and a lot of Texas hospitality. The ranch complex offers space for seated dinners and themed events. Live horse racing April through July, October and November. Group sales, 972-237-1150. I-30 at St. Hwy 360, Arlington; group sales, 817-640-8900; www.sixflags.com. The promise of a day at Six Flags gets raves from an important group of reunion members: kids and teenagers. Superman Tower of Power, the tallest ride in North America, dominates the fun. Plan your day carefully, call ahead for information, group rates and services. Plan a heavy dose of Texas history for your reunion. 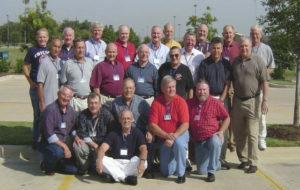 Texas Heritage Trails has information to help plan your reunion in various regions of the state. The Texas Lakes Trail brochure includes the Dallas area. Independence and Chisholm Trails have their own brochures for planning. Also available is African Americans in Texas which follows their contributions to Texas history.